New members: WELCOME to our newest member Kerry O'Connor! Voices for Service is an open community club that meets at First State Bank; 202 N. Prospect Rd in the second floor conference room. We meet on the first and third Tuesday of each month, from 11:30am to 12:30pm. Contact our Club President - Mike Guaderrama 309.706.8476. Bring your lunch - Bring a friend - Come join us! We are always accepting new members and guests are always welcome! Thank you all for helping put on another "EPIC" Guest Day. I look forward to doing this agian soon! Douglas Schwalm, thank you for answering our call for assistance. We look forward to working with you and growing into a distinguished club. 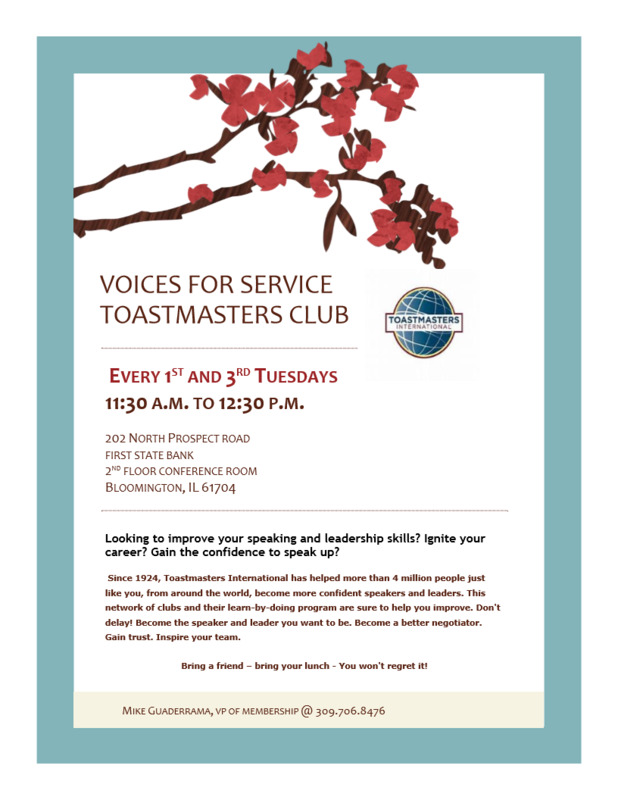 Congratulations to "Voices for Service" Toastmasters Club, we had an awesome "Guest Day" and great turnout. I appreciate all the help from the members and I look forward to doing this again in April.